City in the district of Swabia, Bavaria; till 1803 a free city of the German empire. 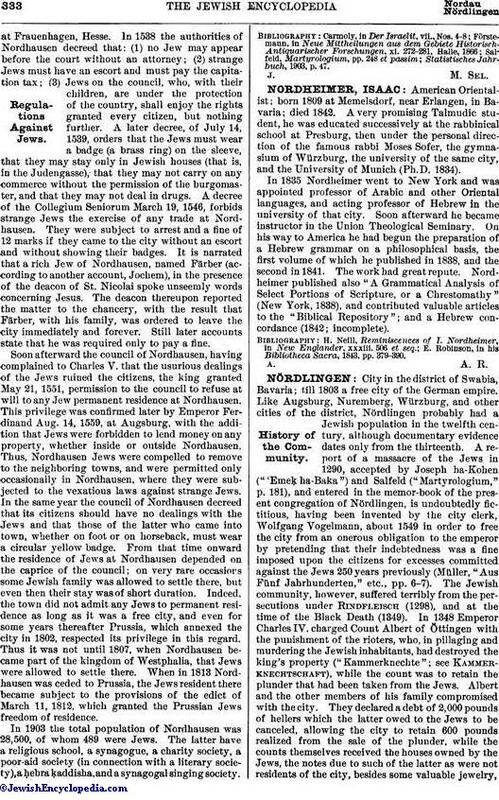 Like Augsburg, Nuremberg, Würzburg, and other cities of the district, Nördlingen probably had a Jewish population in the twelfth century, although documentary evidence dates only from the thirteenth. A report of a massacre of the Jews in 1290, accepted by Joseph ha-Kohen ("'Emeḳ ha-Baka") and Salfeld ("Martyrologium," p. 181), and entered in the memor-book of the present congregation of Nördlingen, is undoubtedly fictitious, having been invented by the city clerk, Wolfgang Vogelmann, about 1549 in order to free the city from an onerous obligation to the emperor by pretending that their indebtedness was a fine imposed upon the citizens for excesses committed against the Jews 250 years previously (Müller, "Aus Fünf Jahrhunderten," etc., pp. 6-7). The Jewish community, however, suffered terribly from the persecutions under Rindfleisch (1298), and at the time of the Black Death (1349). In 1348 Emperor Charles IV. charged Count Albert of Öttingen with the punishment of the rioters, who, in pillaging and murdering the Jewish inhabitants, had destroyed the king's property ("Kammerknechte"; see Kammerknechtschaft), while the count was to retain the plunder that had been taken from the Jews. Albert and the other members of his family compromised with the city. 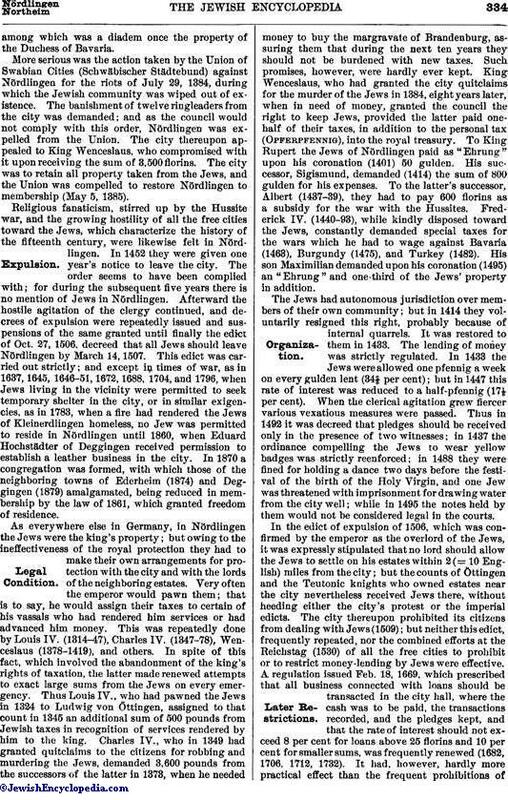 They declared a debt of 2,000 pounds of hellers which the latter owed to the Jews to be canceled, allowing the city to retain 600 pounds realized from the sale of the plunder, while the counts themselves received the houses owned by the Jews, the notes due to such of the latter as were not residents of the city, besides some valuable jewelry,among which was a diadem once the property of the Duchess of Bavaria. More serious was the action taken by the Union of Swabian Cities (Schwäbischer Städtebund) against Nördlingen for the riots of July 29, 1384, during which the Jewish community was wiped out of existence. The banishment of twelve ringleaders from the city was demanded; and as the council would not comply with this order, Nördlingen was expelled from the Union. The city thereupon appealed to King Wenceslaus, who compromised with it upon receiving the sum of 3,500 florins. The city was to retain all property taken from the Jews, and the Union was compelled to restore Nördlingen to membership (May 5, 1385). Religious fanaticism, stirred up by the Hussite war, and the growing hostility of all the free cities toward the Jews, which characterize the history of the fifteenth century, were likewise felt in Nördlingen. In 1452 they were given one year's notice to leave the city. The order seems to have been complied with; for during the subsequent five years there is no mention of Jews in Nördlingen. Afterward the hostile agitation of the clergy continued, and decrees of expulsion were repeatedly issued and suspensions of the same granted until finally the edict of Oct. 27, 1506, decreed that all Jews should leave Nördlingen by March 14, 1507. This edict was carried out strictly; and except in times of war, as in 1637, 1645, 1646-51, 1672, 1688, 1704, and 1796, when Jews living in the vicinity were permitted to seek temporary shelter in the city, or in similar exigencies, as in 1783, when a fire had rendered the Jews of Kleinerdlingen homeless, no Jew was permitted to reside in Nördlingen until 1860, when Eduard Hochstädter of Deggingen received permission to establish a leather business in the city. 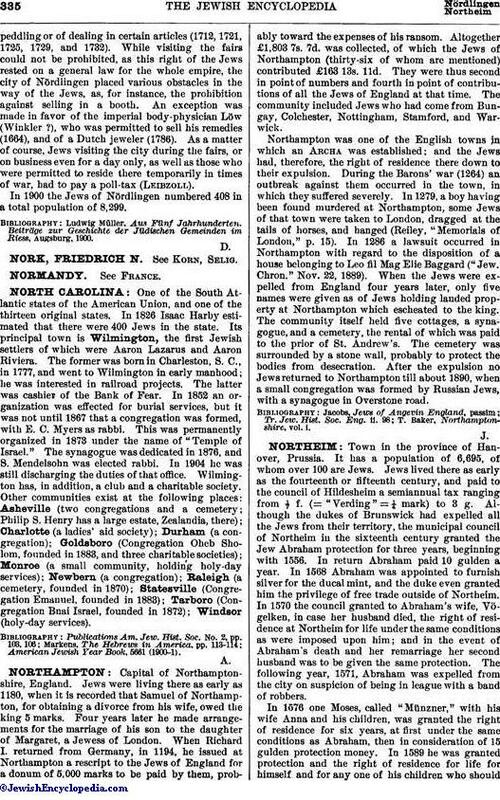 In 1870 a congregation was formed, with which those of the neighboring towns of Ederheim (1874) and Deggingen (1879) amalgamated, being reduced in membership by the law of 1861, which granted freedom of residence. As everywhere else in Germany, in Nördlingen the Jews were the king's property; but owing to the ineffectiveness of the royal protection they had to make their own arrangements for protection with the city and with the lords of the neighboring estates. Very often the emperor would pawn them; that is to say, he would assign their taxes to certain of his vassals who had rendered him services or had advanced him money. This was repeatedly done by Louis IV. (1314-47), Charles IV. (1347-78), Wenceslaus (1378-1419), and others. In spite of this fact, which involved the abandonment of the king's rights of taxation, the latter made renewed attempts to exact large sums from the Jews on every emergency. Thus Louis IV., who had pawned the Jews in 1324 to Ludwig von Öttingen, assigned to that count in 1345 an additional sum of 500 pounds from Jewish taxes in recognition of services rendered by him to the king. Charles IV., who in 1349 had granted quitclaims to the citizens for robbing and murdering the Jews, demanded 3,600 pounds from the successors of the latter in 1373, when he needed money to buy the margravate of Brandenburg, assuring them that during the next ten years they should not be burdened with new taxes. Such promises, however, were hardly ever kept. King Wenceslaus, who had granted the city quitclaims for the murder of the Jews in 1384, eight years later, when in need of money, granted the council the right to keep Jews, provided the latter paid one-half of their taxes, in addition to the personal tax (Opferpfennig), into the royal treasury. To King Rupert the Jews of Nördlingen paid as "Ehrung" upon his coronation (1401) 50 gulden. His successor, Sigismund, demanded (1414) the sum of 800 gulden for his expenses. To the latter's successor, Albert (1437-39), they had to pay 600 florins as a subsidy for the war with the Hussites. Frederick IV. (1440-93), while kindly disposed toward the Jews, constantly demanded special taxes for the wars which he had to wage against Bavaria (1463), Burgundy (1475), and Turkey (1482). His son Maximilian demanded upon his coronation (1495) an "Ehrung" and one-third of the Jews' property in addition. The Jews had autonomous jurisdiction over members of their own community; but in 1414 they voluntarily resigned this right, probably because of internal quarrels. It was restored to them in 1433. The lending of money was strictly regulated. In 1433 the Jews were allowed one pfennig a week on every gulden lent (34⅔ per cent); but in 1447 this rate of interest was reduced to a half-pfennig (17⅓ per cent). When the clerical agitation grew fiercer various vexatious measures were passed. Thus in 1492 it was decreed that pledges should be received only in the presence of two witnesses; in 1437 the ordinance compelling the Jews to wear yellow badges was strictly reenforced; in 1488 they were fined for holding a dance two days before the festival of the birth of the Holy Virgin, and one Jew was threatened with imprisonment for drawing water from the city well; while in 1495 the notes held by them would not be considered legal in the courts. In the edict of expulsion of 1506, which was confirmed by the emperor as the overlord of the Jews, it was expressly stipulated that no lord should allow the Jews to settle on his estates within 2 (= 10 English) miles from the city; but the counts of Öttingen and the Teutonic knights who owned estates near the city nevertheless received Jews there, without heeding either the city's protest or the imperial edicts. The city thereupon prohibited its citizens from dealing with Jews (1509); but neither this edict, frequently repeated, nor the combined efforts at the Reichstag (1530) of all the free cities to prohibit or to restrict money-lending by Jews were effective. A regulation issued Feb. 18, 1669, which prescribed that all business connected with loans should be transacted in the city hall, where the cash was to be paid, the transactions recorded, and the pledges kept, and that the rate of interest should not exceed 8 per cent for loans above 25 florins and 10 per cent for smaller sums, was frequently renewed (1682, 1706, 1712, 1732). It had, however, hardly more practical effect than the frequent prohibitions ofpeddling or of dealing in certain articles (1712, 1721, 1725, 1729, and 1732). While visiting the fairs could not be prohibited, as this right of the Jews rested on a general law for the whole empire, the city of Nördlingen placed various obstacles in the way of the Jews, as, for instance, the prohibition against selling in a booth. An exception was made in favor of the imperial body-physician Löw (Winkler ? ), who was permitted to sell his remedies (1664), and of a Dutch jeweler (1786). As a matter of course, Jews visiting the city during the fairs, or on business even for a day only, as well as those who were permitted to reside there temporarily in times of war, had to pay a poll-tax (Leibzoll). In 1900 the Jews of Nördlingen numbered 408 in a total population of 8,299. Ludwig Müller, Aus Fünf Jahrhunderten. Beiträge zur Geschichte der Jüdischen Gemeinden im Riess, Augsburg, 1900.